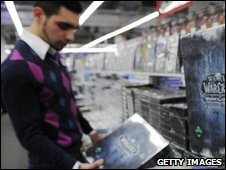 Sales of videogames in the UK hit an all time high of 82.8m in 2008, figures from the industry trade body show. The Entertainment and Leisure Software Publishers Association (ELSPA) said that consumers spent £4.03bn on video game hardware and software. Total video game sales were in excess of £1.9bn, 23% more than the previous year and more than double the total earnings over the past five years. Console sales accounted for another £1.422 billion. 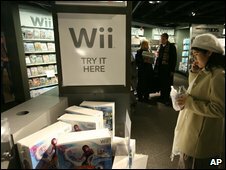 Figures from ELSPA suggest that video games for the Nintendo Wii made up almost a quarter of all software sales, with more than 20m games sold. This was an increase of 112% on the previous year. Software for the firm's handheld game console - the Nintendo DS - also proved popular, with more than 19.1m copies sold. Games for Microsoft's Xbox 360 also did well, with a 51% rise in sales. And there was some good news for Sony. Sales of software for its PlayStation 3 console role by 145%, selling 10.4 million units - more than double the 4.2m games sold in 2007. ELSPA's managing director, Michael Rawlinson, said the growth of games pitched at the casual user had help fuel the growth. "Videogaming is increasingly bringing families together with the introduction of so many outstanding family-based console titles. "These have really opened up the market to those who may never have even considered playing a videogame before," he said. But with economic worries, and a shortage of blockbuster titles, some experts think 2009 may not be so rosy. Speaking to the BBC, veteran game designer Peter Molyneux said he had concerns. "While there is stuff in 2010 we can look forward to, off the top of my head, I cannot think of anything this year that really excites me." "Everyone says games are good value for home entertainment, despite the relatively high price. I'm not so sure. "I think we're going to see a lot of price pressure put on games," he added.